Built by the Wellington and Manawatu Railway Company and opened in 1894, this grand 32-room house, seated 100 diners, and could shelter 500 people. It spanned Steyne Avenue at this site. Visitors walked through the house from the station to the beach. It burned down in 1906. Even before the last spike on its rail line had been driven at Otaki in November 1886, the Wellington and Manawatu Railway Company began running excursion trains from Wellington to Plimmerton. 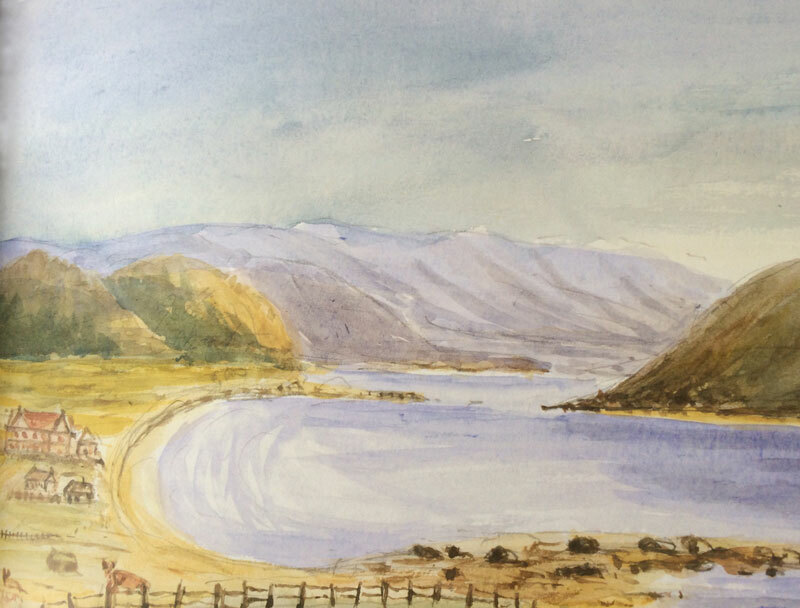 In August 1885, a party of 400, including members of the General Assembly (Parliament), some with ladies, took the train to Plimmerton for the day travelling in the company’s six palace saloon cars. One thousand people (in total) made the first public trips on 2 and 4 October that year. The popularity of these excursions continued for many years. The first building at the railway station was a refreshment booth, erected by Thos Boult and first advertised 21 October 1885. By December that year the company advertised refreshment rooms for lease, with the successful tender from J. Lennie. In 1894, when the company added a two storeyed building with 32 guest rooms, it seems the existing refreshment rooms remained as a single storeyed dining room seating up to 100 people. The entire building, named Plimmerton House, could shelter 500 people. It also contained a conservatory, patio, ladies’ drawing room and a men’s smoking room. There were boat and bathing sheds, poultry runs and excellent kitchen gardens. The house occupied an area stretching from Queens Ave to Bath Street and across what would become part of Steyne Ave. The entrance was alongside the small railway station. Visitors arriving by train could walk directly from the station platform, in through the main doors, follow along a hallway and out again onto the sand dunes at the beach. Apart from one or two cottages, Plimmerton House was the only substantial building in Plimmerton for quite a few years. From 1894, Charles Plimmer (son of John Plimmer) was the manager and later, from 1902, he was the owner after the title was transferred from John Plimmer who bought the property from the company in 1897. Such an early and significant building was used for many community purposes over the years. In 1886, Mr J A Lennie offered a large room for dancing at the refreshment rooms. A church service in 1897 saw a collection in aid of the fund for building a church in the district realise 16 shillings and two pence and in 1898, the Rates Board meeting was held there. 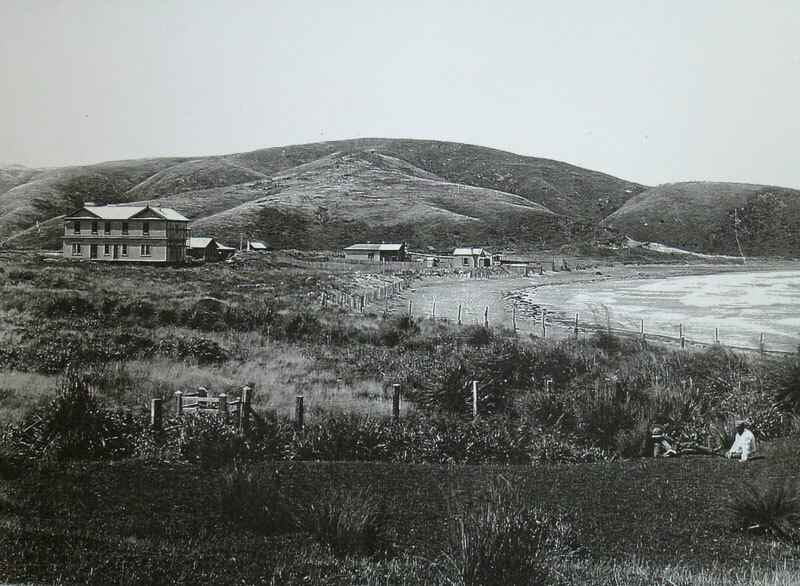 Plimmerton’s first postal service operated from Plimmerton House in 1894 when a telegraph message appointed the caretaker as ‘Post Master without salary’. Later in the year, Charles Plimmer took on that role. In July 1896, the Wellington and Manawatu Railways Company directors hosted the Premier, Richard John Seddon, the Archbishop of Wellington and other dignitaries of the time, to a function at Plimmerton House to mark John Plimmer’s eightieth birthday. Other proprietors later leased the business from Charles Plimmer, and described the accommodation as full to overflowing throughout the season which ran from 1 November to early March. Each of these proprietors brought something different to their tenancy.